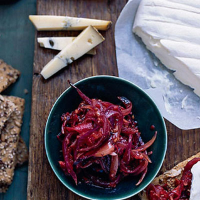 This simple chutney is a fantastic accompaniment to cheese. Place all the ingredients in a large pan and bring to the boil. Simmer gently for an hour until the liquid has evaporated and the onion is tender. If it starts to dry out too quickly, add a splash of water. Leave to cool, then chill until ready to serve. There’s enough here to fill two 250g jam jars – put into sterilised jars, store in the fridge and use within a week. Best served at room temperature.